The 23rd April is taken to celebrate both St George’s day, patron saint of England, and birthday of the great English bard, William Shakespeare. In fact not much is known about either the knight or the playwright. St George was probably not English and hardly stepped on English soil and certainly did not kill a dragon. Without doubt it is now commonly accepted in sports, athletic circles and events that the English Cross represents England. The incorrect waving of the Union Flag, or Jack, for England is fast disappearing. Painting of faces with the English cross at recent world cup events was an expression of national sentiment, English national sentiment, by ordinary and working class people. The Scots, Welsh and Irish have no qualms about who they are and what nation they belong to and what flag they fly they certainly do not consider themselves British except some Unionists in the six counties of Northern Ireland. Although it is becoming clearer, we the English, are still a little mixed up about whether we are English or just "British". This is because England was the apex of the British Empire which in fact was an English Empire where fag ends persist today in Gibraltar, Northern Ireland, Falkland Isles and several other spots around the world. The term "British" was highlighted in the days of imperialism to rub out the idea of nations and nationalities. The apt and current parallel form of imperialism is now being consolidated by European Union. Wales and Scotland are to be merely regions and not nations. England is divided into several regions like the rest of the EU. Some Euro-regions straddle national boundaries. According to the Treaty on European Union we are all supposed to become "European Citizens" with duties and rights as yet unspecified. Apart from one or two exceptions, according to international law, you cannot be a citizen of two states at the same time. This means we are intended to be citizens of a superstate and lose our national identity as part of the process of taking away the powers of nation states and national governments, thereby national democracy and all forms of democracy. To progress democracy into the economic and other fields requires real socialism. The prerequisites of socialism are therefore national independence and national democracy. Hence the thrust to European Union is the antithesis of democracy, national independence and socialism. A nation state and national government is strongest when the nation is the strongest. In the case of Britain this entails several nations and peoples whatever class they come from. A current example of the strength of a nation irrespective of class is that of the Serb nation who have united against the illegal and barbaric NATO bombing. Socialism and nationalism are not comparable just as flour and electricity are not comparable. Socialism is an economic system where production and appropriation proceed together in common but where personal consumption is related to personal contribution. Nationalism or patriotism does not define a system of society but can define a sentiment, doctrine or movement. In the context of today’s political situation, nationalism or patriotism has the aim of securing national independence, an aim which is democratic but not inherently socialist. Therefore it is the duty of all socialists to be the best democrats and the best nationalists or patriots. The action of NATO in the Balkans and intense rivalries between the imperialist powers involved is to shred the UN Charter and international law, especially the right to self determination of nation states. The object of European Union with a single currency and single army is to completely take away the right of EU member states to their own self determination. European Union is being consolidated as a capitalist corporatist superstate to suit transnational capital. It is big capital which is opposed to nationalism, nation states, national democracy and all forms of democracy. The anti-thesis of transnational capital is therefore the nation state, nationalism or patriotism and democracy. Some of the factors which bind a nation together include a common language, history, geographical area, economic system, culture and democracy. Democracy requires the minority to accept majority decisions and can only happen within a nation state and not between nation states. Britain is a multi-cultural, multi-racial, multi-nation state comprises three predominant nations and part of the Irish nation. This mini-Common Market is dominated by England. Britain in turn is now subjugate over vast areas of economic, political and military life to the European Union superstate. This is done through common policies, laws, directives and regulations on foreign policy and a European Army, a single currency even though we have not joined the last stage of economic and monetary union, agriculture, steel , shipbuilding, coal production, fishing grounds, trans-European roads, judicial system, taxation via VAT and so on. A full understanding of the importance of what is called the "National Question" is required to broaden the anti-EU movement in Britain where all classes take part, especially the working class and the organisations of the labour movement who normally represent them. The Irish, Scots, Welsh and ethnic minorities in Britain are mostly clear who they are and proud of their nationality. 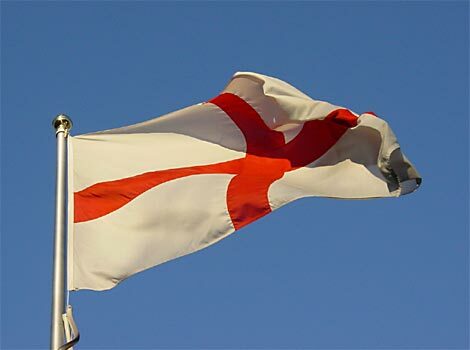 It is the English who have to learn further their nationality and that is why the English cross and the English national day of St George are important. There should b a national holiday on 23rd April in addition to May Day and alongside St Andrew’s Day, St David’s Day and St Patrick’s Day. The peasants in their 1381 revolt had no problem in flying the English cross in their irregular army and we today should not be afraid to do so either, whether this be an expression of our utter disgust and opposition to Britain’s part in NATO or in the struggle to extricate ourselves from the prison of European Union. *First published in the Morning Star on 23 April 1999 - a paper opposed to Britain's membership of European Union, opposed the undeclared war and NATO bombing in the Balkans and is a daily paper of the left. The piece was Partly based on a CAEF discussion pamphlet by John Boyd - "European Union, National Independence and Democracy" now out of print.